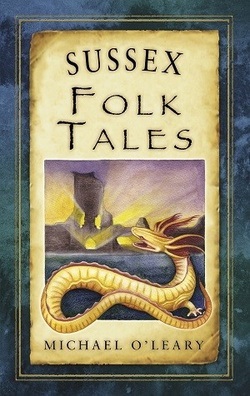 Michael O’Leary’s Sussex Folk Tales is like one of the many books of reminiscences, hauntings, local histories, weird tales, autobiography, and so on, which can be trawled for gems of pseudo-information and foaflore for redeployment on performative walks. Except that O’Leary’s book is cover to cover gem: androgynous knuckers, screaming simulacra, circumambulations, fallen trees blown back up, accidental car washes, Moore on the Moon. O’Leary’s’ tales mill about each other like zombies in a well stocked mall; disconnected snippets of past lives somehow stitched together by reflexive writing. For O’Leary forefronts his tricks, his rules of three and vernacularising of classic tales. He hollows out the quest of the Flying Dutchman, turns the myth into a frame, then frames it. Take a step in and door after door after door swings open. The snatches of anecdote and hints of ‘faerie’ connect in a landscape of myth, a place where “The Thatched House is one of the few cottages that isn’t thatched”, where “Love death – die old”, where the seemingly ordinary, like flint, is a mystery and where a giant rat made of ketamine stalks the pier. Reading Michael O’Leary’s book is like taking a fabulous, hypersensitised wander – and he does us the honour of citing mythogeography’s narrative walks – and finding a church entrance that looks like “a wardrobe, so stepping back out of the church entail[s] entering a wardrobe and stepping out into the wondrous land of Sussex”.